Zillie Falls is located near Theresa Creek Road and is part of Waterfall Circuit, Millaa Millaa in Queensland , Australia. 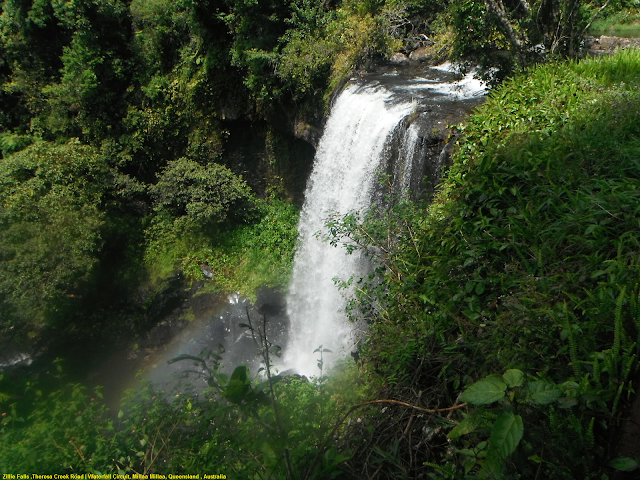 Just past Millaa Millaa is the turn off for Zillie Falls, part of the waterfall circuit of beautiful rainforest region. There is a viewing platform at Zillie that provides a wonderful view of the cascading waters, as well as plenty of room to enjoy a picnic lunch or just relax and take in the surroundings. Zillie Falls is 7.5km past the Millaa Millaa falls.The walking path to the falls is not very clearly marked and it is much easier to see the car park on the right side of the road before the bridge.One of the trees in this particular car park is home to a colony of Flying Foxes can easily be seen.A short walk across the road takes you through rainforest to the viewing area.There is no access to the bottom of the waterfall from the platform but there is a good view of the proceeding rapids and the top of the falls.There is no swimming access at this waterfall.